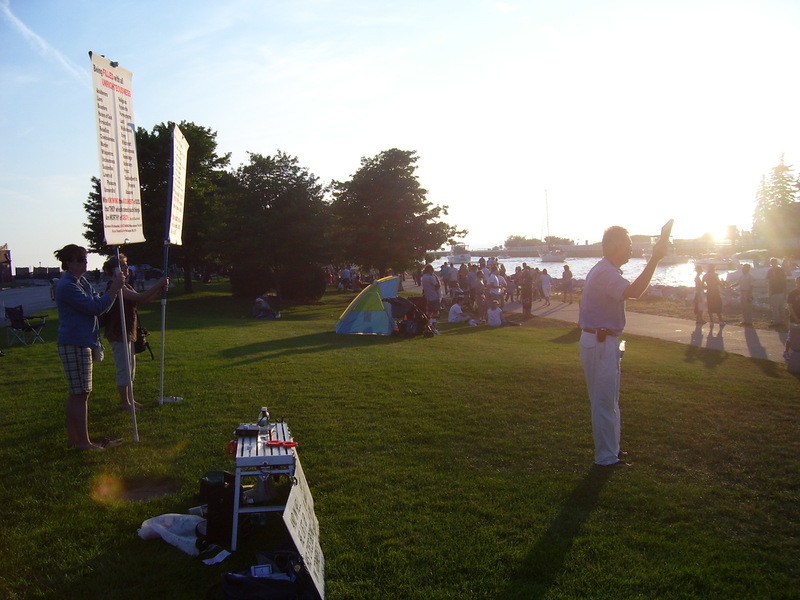 The Blog of Dr. T. Michael W. Halcomb: Street Preaching or...Servant Evangelism? 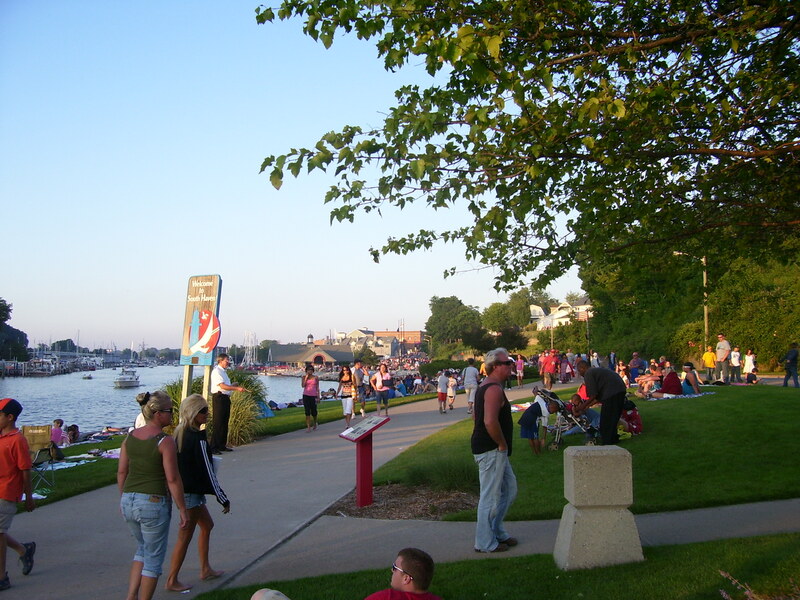 This weekend, the family and I went to the beach for a day and decided to also stick around for the fireworks show later that evening. Our day was very eventful and enjoyable but that all changed from about 5pm-9pm. In that window of time, a group of street-preaching men and sign-holding women, decided that they would take over the grassy knoll that we and other people were sitting on. Not only were they polluting the air with their noise, they passed out hundreds or thousands of tracts that ended up littering the sidewalk for a good quarter mile! Even more, you could hear all of the complaints and grumbles and frustrations of people as they walked by. A couple of guys even asked me, "How can you even sit around here?" It was both a fair and good question. But this whole event led me to think about Christianity and how some people today make it totally irrelevant and how others come to find it totally tasteless. 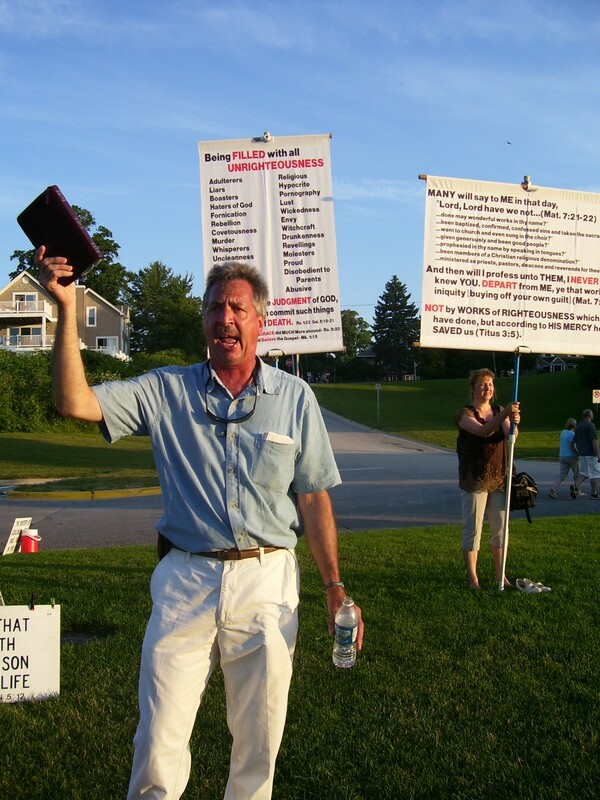 Admittedly, I used to have the mindset that street-preaching was a necessity. I used to think Ray Comfort and Kirk Cameron had come up with a great approach. But now, I think otherwise. I think the whole open-air, soapbox, street-preaching thing verges on absurdity and only makes Christians and Christianity seem that much more "supsicious" and "out-of-touch with reality. If you can't get a good feel from the pictures here about how this "street preaching" session went yesterday, let me give you a few examples of things that happened with me personally. For one, I spoke to one of the preachers / tract-givers and told him that all of his tracts were ending up in the trash can 10ft. away or on the ground causing litter. His response was: "That's a good testimony. Because, well, you know what: On the great day of judgment when those who threw those down see God face-to-face, they will have no excuse; that stands as a testimony against them. When they see God, He'll flash that scene before their very eyes and they will have no excuse, no, they'll be condemned." When the guy said this, I couldn't believe what I was hearing. But to make matters worse, these guys were not just impinging on everyone's weekend fun, they were causing confusion when it comes to the message of the Gospel. 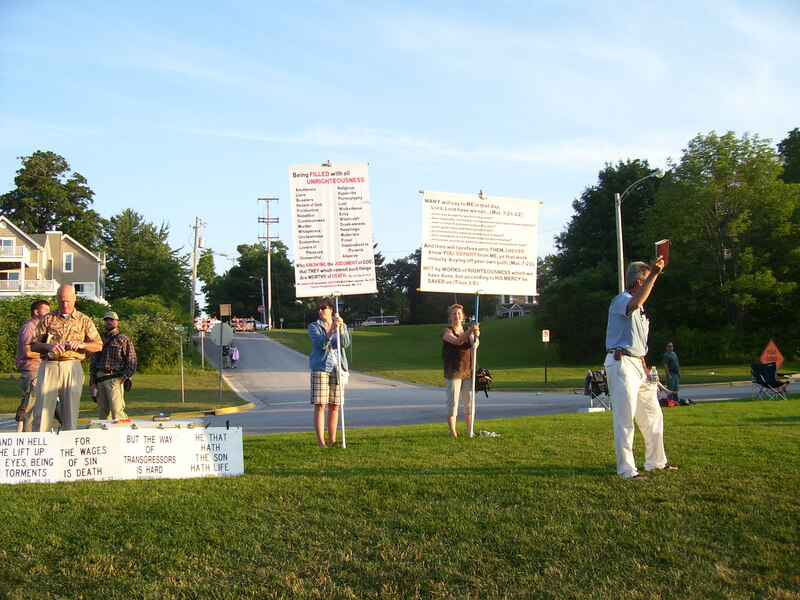 Here's what I mean: On the one hand, they saying things like "Jesus loves you", "God loves you", etc. But on the other hand and at the same time, they were yelling, screaming, Bible-waving and fist-pounding. The point is: The body language totally contradicted portions of their message. It's like a husband beating a wife and telling her that's his way of showing his love for her. Now, in the time that I saw these people preaching, I pretty much only saw people who were already of the same mindset as them, stop to chat. Everybody else was laughing, snickering, rolling their eyes or trying to come up with some way to ask them to leave. A guy sitting next to me said something to them like: "Man, everyone just came to have a good time tonight and you're just interrupting it and frustrating everyone." Once again, the tract-giver's reply was: "That's a good testimony." It's like their goal was to just get on everyone's nerves. 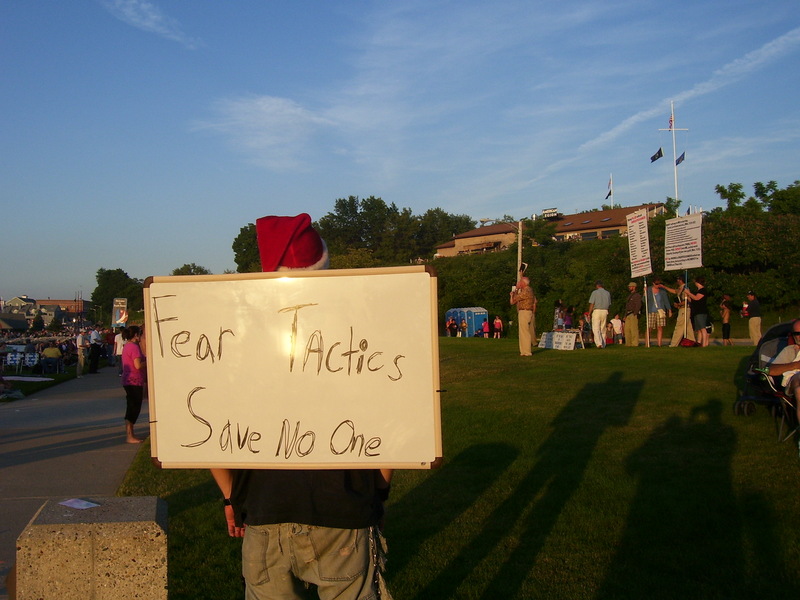 At one point, I saw a young man walk by with a sign on his back that said "Fear Tactics Save No One". I couldn't agree more! This fellow was clearly not a Christian and he was definitely annoyed. Every year he attends this fireworks show and every year, he has to deal with these loud, obnoxious street-preachers. I went over and talked with him just for a moment and he was curious as to who I was. I gave him my contact information, told him a little about my background and we just talked for a few minutes. As a Christian, I was able to carry on a normal conversation with this guy and even talk about my faith to him, without coming across as annoying or anti-intellectual. Needless to say, it seems to me that "simple conversation" can go a lot further than relentlessly screaming in people's ears. And that leads me to another point: These street-preachers were attempting to strip the Gospel of its depth and mystery by making it all sound so simple. I mean, these people were KJV-onlyists, so, you can probably understand the type that I'm referring to here. But the proble I have with all of this is that in the process of uninvitedly encroching on people's territory, they also simplified things so much that in the end, there's nothing left to ponder and wonder about. For me, that's definitely a "testimony against" the biblical text and Christian lifestyle. You know, I could say a ton more about this but the truth is, these loud-mouth men would have done better for Christ and the Good News had they found more relevant ways to make Jesus known. I mean, for goodness' sake, they all formed a semi-circle at the end and sang a hymn (and placed all the ladies behind them where nobody could see them). This really got people laughing and snickering. After this, the formed a full-circle, took a knee (like I used to do at the end of football practice) and began praying. And guess what, after they prayed, they all stood up, shook each other's hands, gave some high-fives (just like after football practice) and got in their buses and drove off (just like after football games). Honestly, I can think of nothing more arrogant and irrelevant. I mean, the high-fives and laughing and whatnot, it all made this seem like a game or contest, which, I believe, is the mindset most of these pople have anyway (hence the phrase: "Let's win some for Jesus"). Newsflash street-preachers: The Gospel is not a game! This all got me wondering, How did Jesus do it? How did Jesus get the crowds to come and stick around? Well, one thing I know is that people were often coming to Him that were interested; He wasn't taking over their territory and bugging them. I also know that He was healing people, providing for people and piquing people's interests as opposed to turning them off. In other words, Jesus was all about serving those who desired to be in His presence. Even more, Jesus (and Paul, too) contextualized the Good News. He didn't come to the people acting totally arrogant and irrelevant. So, it leads me to make the point that to a great degree, street preaching needs to stop! A new paradigm of servant evangelism needs to take precedence. Showing acts of kindness and offering a relevant word about God's nature and character is needed more than screaming words and contradictory body language. The congregation I'm currently part of tapped into this over the weekend too, when, in just a few hours, they gave out hundreds and hundreds of cold bottles of water to parade-goers. Sometimes they even prayed for sick and wounded people and were thanked. The acts of kindness opened doors to share Jesus' love, even in a non-threatening, non-arrogant, tasteful way. And in my opinion, this is the way forward! Thanks for sharing this, Michael. I often feel I am better able to carry on a conversation with those who aren't Christians better than those who are, particularly this particular "flavor" of Christian. Good for you for trying to engage them. I have found my own encounters with folks of this mindset, however, to be relatively pointless. When they came to the threshing floor of Nacon, Uzzah reached out and took hold of the ark of God, because the oxen stumbled. 7 The LORD's anger burned against Uzzah because of his irreverent act; therefore God struck him down and he died there beside the ark of God. God quite likes fear tactics. Apparently he strikes people down dead 'pour encourager les autres'. The early church was hot on fear. The church wasn't too scared of worldly persecution, but their god had been killing believers again. I don't think the point is that "fear" should be banned but rather, the issue is that the "tactics" these men were using in both vocal and body language, were contradictory to the "Good News" of Jesus. Second of all, there is a real sense in which contextualizing the "Good News" is necesarry! In a culture where "fear tactics" have been used as manipulatory tools and have totally turned people off to even hearing the "Good News" or conversing with Christians, the types of things these people were doing should actually be considered "irreverent" acts! Pat, Good to hear from you buddy. I can totally relate to your sentiments about relating more easily to non-believers when it comes to Christian faith than those who often call themselves Christians. Yeah, I've been talking with "sign guy" on Facebook now and he's actually commented on this post (which is a "note" on FB) and we're getting to discuss a little more about the events. Hope you and the fam are well, Pat! I think your presumptions here are quite errant. Nowhere does it say that Jesus sent them out to preach a message to overthrow Rome. Was Jesus' message often subversive to the "Roman Gospel"? Absolutely. But the necssity of Jesus' Good News was not dependent upon Rome or caesar or anyone else. The message of Jesus was for the whole human race that had been overwhelmed with sinfulness. know what you think of our video. I can see Steven's point on this. I think that we all read the bible (to differing degrees) based on what we believe that is says or what God has already told us. If we believe that God is loving, we will gloss over or poo poo verses that seem to state otherwise. This is how I typically approach those verses. If you want to believe that God wants to judge the world and punish those who fall short, you can find plenty of verses to back up that view as well. It is not odd to me that you found more in common with a non-Christian than those in the protest. The love of God is imprinted on my heart. It took religion to teach me to judge. Zac, great points! We all bring our own experiences, definitions & lenses to the text...for sure. I still don't know that Steve's point is exactly relevant to the point I was trying to make but alas, I get your drift. Love the contrasting statement about God's love & religion...good stuff, Zac. Glad you're commenting on here and interacting. Btw, I couldn't figure out how to leave a comment on your blog...is it possible? Yeah, you have to click on the post title, but I'm looking at a way to have easier access to leaving comments. One of the things that Blogger has on Wordpress for sure. I'm just at a point where I am ok with my background informing my beliefs about God, the bible, truth, etc. For a long time, I wanted to strive for objectivity, and I really believe that it is impossible, as a concept, to be truly objective. There are varying degrees, I'm sure, and it all comes down to open-mindedness. That can be dangerous though. If I am open too much, then I'm not really functioning out of whatever belief I claim to have. Commitments get wishy washy. Does that make sense? Good blog though. I love reading from a guy who doesn't pull punches and doesn't back down. You are legit brother. Thanks for the compliments dude, I appreciate them very much. I look forward to many more interactions; it's good kinda touching base with you again. RE your statements about beliefs, etc., I totally understand as I too strived for that sort of objectivity. While total objectivity isn't possible, I don't rule out the possibility of being able to reach truths that we can firmly stand on without wavering. For instance, while my views of Jesus have been both biased and even transformed at points, I can never have a full, objective understanding of Jesus. However, I can definitely rest assured in the notion that the Gospel writers reports are trustworthy and true and that Jesus, in those reports, is who He claims to be. And this is not just based on blind faith, but rather an "informed" faith (both experientially and in terms of research). So, while there is often a seemingly fine line that we have to tread, I've found that being as honest as possible about my presuppositions and assumptions before approaching texts or entering into dialogue with other believers (ancient or modern) allows me to be much more objective and honest than had I not recognized those things. This also prevents me from being wishy washy all of the time. And while I wouldn't call it wishy washy, necesarrily, I must say that I've learned that to live with the tensions that exist in the biblical texts and in certain theological tenets is both healthy and okay. Even more, it opens myriad aveneues for me to venture further into the mysteries of God and to seek and know Him more. Hope that makes sense. Again, glad to be chatting with you dude. Hope things are going well for you.